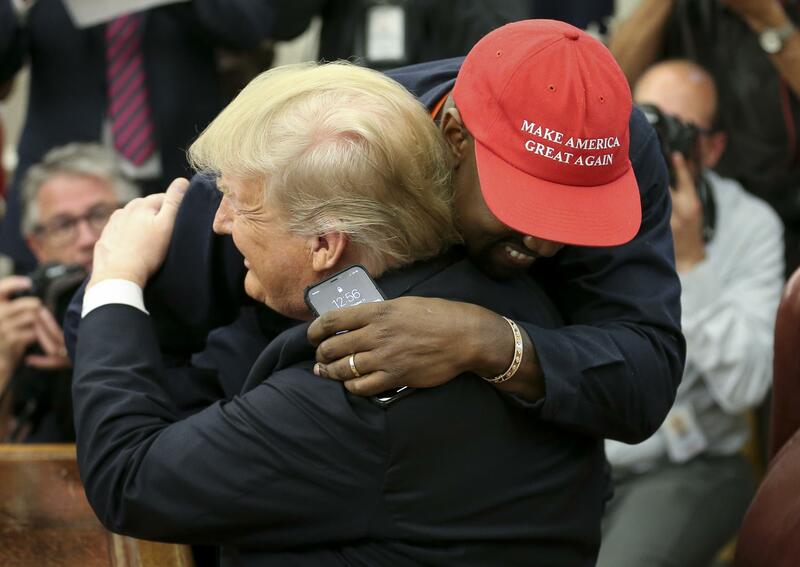 Kanye West, one of President Trump’s most famous and vocal supporters, met with the president at the White House on Thursday for a free-wheeling discussion in which the rapper commanded most of the conversation, earning praise and compliments from the president. West began the meeting by praising Trump's efforts in North Korea saying, "On day one you solved one of [Obama's] biggest troubles. We solved one of the biggest problems." The conversation turned to West discussing the lack of support he received from his Hollywood cohorts with regards to his support of the president. "They tried to scare me to not wear this hat," West said, referring to his "Make America Great Again" hat he wore to the meeting and on a recent appearance on "Saturday Night Live." "When I put this hat on, it made me feel like Superman - my favorite superhero. You made a Superman cape for me." Rapper Kanye West shows President Donald Trump a photograph of a hydrogen plane during a meeting in the Oval Office of the White House, Thursday, Oct. 11, 2018, in Washington. The rapper went on to chastise the NBC sketch show and other liberal-leaning people in the media for their portrayal of the American president. "What I need 'SNL' and liberals to improve on is, if he don't look good, we don't look good. He has to be the freshest, the flyest, have the flyest planes. He has to look good!" he said. "When we make everything in China and not America, we’re cheating on our country." West would discuss many topics in a rambling rant to reporters that included everything from bringing manufacturing to the country, his personal business deals, ending stop-and-frisk in Chicago and the 13th Amendment. "There's a lot of things that affect our mental health that put us into this trap door that is the 13th Amendment," West said. West went on to reference his recent bipolar disorder diagnosis saying that he was misdiagnosed by a doctor that said he was merely sleep-deprived. The chat was then turned over to reporters who asked West about his feelings on gun control. "Illegal guns is the problem, not legal guns, we have the right to bear arms," he said bluntly. The rapper's statement lasted nearly 10 minutes before the president chimed in to compliment West on his honesty. "I tell you what, that was pretty impressive," Trump said after West seemed to run out of steam. "That was quite something." "It was from the soul. I just channeled it," West replied. Trump continued to compliment the rapper, who talked about spreading love through the country. When asked if West’s previous declarations that he’ll run for president seem reasonable to Trump, he noted that he thinks Kanye “could very well be” candidate material. The Chicago-raised rapper and the New York real estate mogul-turned president have a long friendship that goes back before the 2016 election. When West declared in 2015 he would run for president in 2020 during a 2015 VMAs acceptance speech, Trump, then just a presidential candidate, was not fazed, and welcomed the competition. “I hope to run against him someday,” Trump told Rolling Stone magazine. “He’s said very nice things about me in the past … extremely positive things,” Trump said. A year later, West visited the then president-elect at Trump Tower in New York in December 2016. West has received a lot of backlash from fans and his fellow celebrities for his support of the president including a recent slew of criticism from several members of “Saturday Night Live” who bashed West after going on a pro-Trump rant at the end of the show earlier this month. “What Kanye said after we went off the air last week was one of the worst, most awkward things I’ve seen here, and I’ve seen Chevy Chase speak to an intern,” "SNL" star Pete Davidson joked in a skit the following week. West explained to the New York Times in June why he supports Trump, saying there are many more Trump supporters in Hollywood who are just afraid to come forward. West said he had been an underdog his entire career, and that drew him to Trump, a man who many felt could never win the presidency. He claimed the two shared “dragon energy." The star went on to describe breaking free of the "mob-thought" that made him feel obligated to support Hillary Clinton in the 2016 election because of his celebrity and status. Trump returned the love at a campaign-style rally in Michigan in April. Isn't he supposed to be racist? At the top of the video, listen to the sick racist comments by CNN fake news and leftist pigs. Disgusting. Last edited by CatholicCrusader; October 12th, 2018 at 07:46 AM. "Your (MAGA) hat offends me, as a woman"
and you sit in your mom's basement posting snotty childish stupidities. Its easy to see who the ignorant one is. Ah, so that is how you decide who is intelligent. Power and $? What would Jesus say to that? but what do you care what Jesus might or might not say about something? Learn how to speak English man. I didn't say "intelligent", I said "ignorant". Do you know what the difference is? Do you understand the difference between ignorant and unintelligent? You're not very bright are you. Nope, not a believer. Pastor Bob drove the nail into that.